Interested in raising one of these guys? 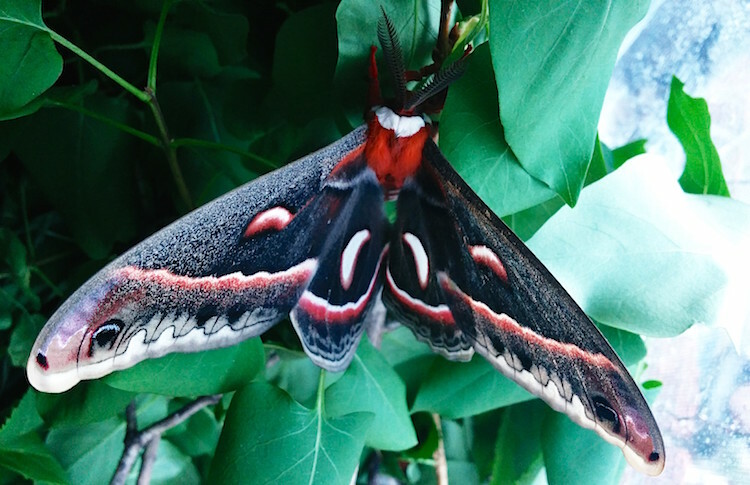 From its caterpillar stage to its eventual release, your cecropia moth will stay safe if you follow these tips. My first encounter with cecropia moths was about 5 years ago when my father took me to his annual Toronto Entomologist Association (TEA) meeting. Professors, insect caretakers and enthusiasts alike attend to present captive and wild species found locally as well as all over the world. 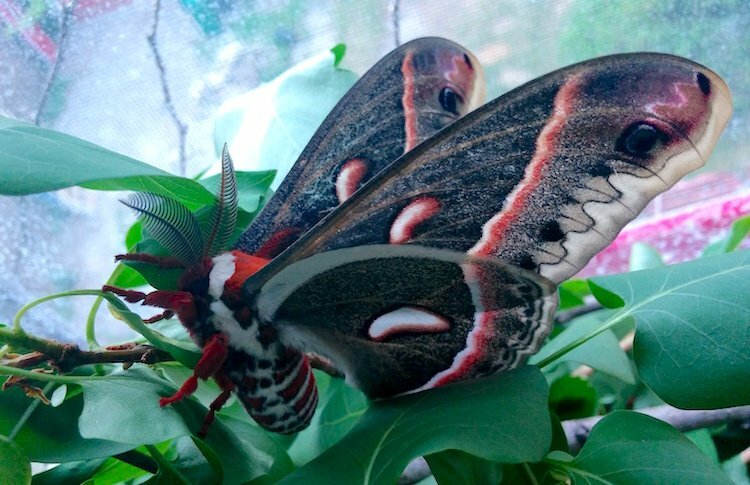 One professor from the University of Waterloo specialized in cecropia moths. Much to my excitement, he had collected more than a dozen cocoons on twigs to hand out to attendees interested in hatching and releasing the moths in their area. Because I am a herper, I have many spare glass reptile aquariums with screen tops that were perfect to safely house my first pair of cecropia moth cocoons. The cecropia moth (Hyalophora cecropia) is North America’s largest and arguably one if its most beautiful moths. It belongs to the insect family Saturnidae, which comprises giant silk moths. Both adult females and males boast an incredible display of bold colors, including black, red, orange, white, gray and shades of lavender. See the large black spots on the tips of each wing? This is an evolutionary defense adaptation that mimics a large black eye, a deterrent to its main predators, namely birds, squirrels and raccoons. Cecropia moths have a life span of only 1–2 weeks, partly because they don’t have jaws with which to eat. The caterpillars need a regular supply of lilac bushes on which to set up their cocoons in the fall. They also love to feed on the flowers and leaves. Cocoons hatch in the end of May and the beginning of June. 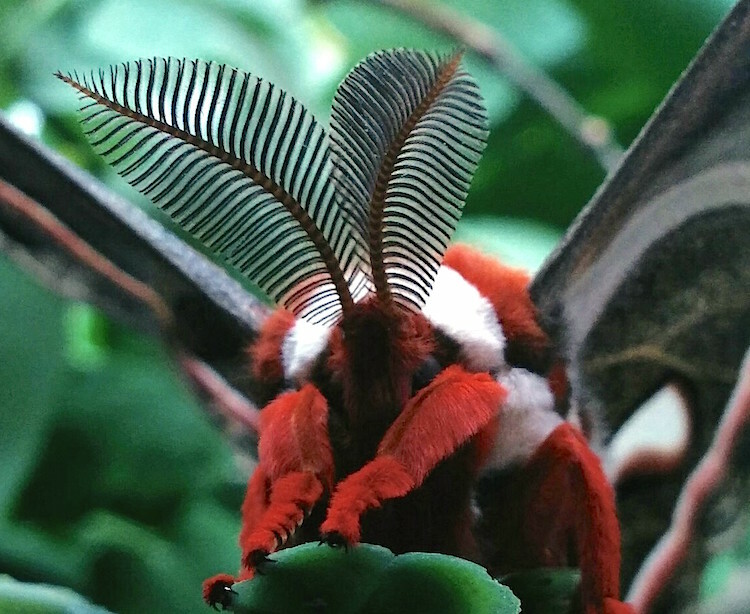 Cecropia moths are born without mandibles, so your adult moth’s sole purpose in life is to hatch, mate, lay eggs and typically die within 1–2 weeks. Allow your male and female moths to mate. They will stay coupled in your tank for approximately 24 hours. Then release the male at dusk to avoid bird predators, and allow the female to lay several eggs in your enclosure before releasing her to lay the remainder of her eggs in the wild. Females have thinner and smaller antennae than males. Males are distinguishable by their thicker, fuller, large antennae that pick up on a nearby female’s pheromones. Never handle a moth’s wings — they are easily torn, disabling moths from flying. Moths emerge usually around 4 to 6 a.m. It will take several hours for their wings to open and dry, and this is the perfect opportunity to take some incredible photos. These moths are calm. They’ll climb onto your hand and cling to your clothing if you offer them a safe place to rest. Both males and females have a large fuzzy abdomen, striped like an orange-and-white candy cane, with white spots on its sides and a fuzzy red/orange head and legs. They have 3 pairs of jointed legs with tiny black tips. They also have compound black eyes. The moths mate after the female releases pheromones that the male picks up on with his evolved antennae. In the middle night, my Cornish rex cat was going crazy, meowing and jumping onto the aquarium I had left for the past few months beside my bed. When I turned on the light, much to my delight the brown cocoons were dry and empty, and 2 of the most beautiful large moths I had ever seen were clinging to the branches inside the aquarium, slowly opening and closing their wings. I ran for my camera and took many photos of this wondrous display before bringing the aquarium outside and setting it on my front porch. It was around 4:30 a.m. I opened the cage, and offered the moths my hand. They both delicately climbed onto me and clung to my hand and clothing. I remember wishing that one of my neighbors would wake up and witness this amazing metamorphosis as the sun slowly rose. Eventually my new babies had to go mate, lay their eggs and start this fascinating cycle all over again. I watched them fly away, happy and free in the pink morning haze, and I was proud to have given them a safe habitat in which to grow from pupae to adult. That was 5 years ago, and I have raised and released caterpillars to their adult cecropia moth stage every year since that first pair captured my heart.